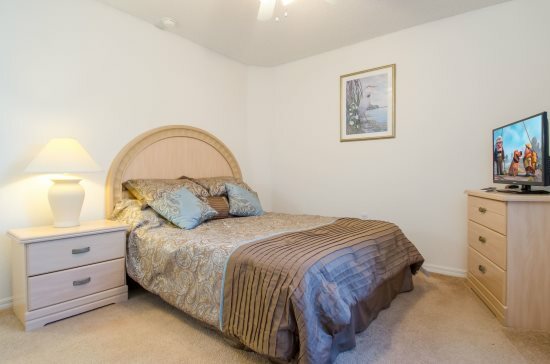 Situated in the popular community of Liberty Village, The villa offers spacious accommodation at an affordable price. Close to shopping and dining on highway 192. 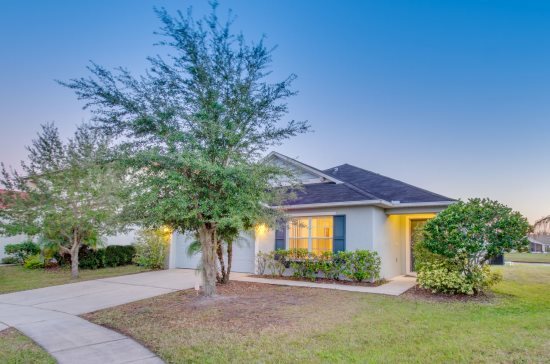 This 4 bedroom 2 bath home is single story and provides plenty of living space for a typical family, and sleeps 8 people. 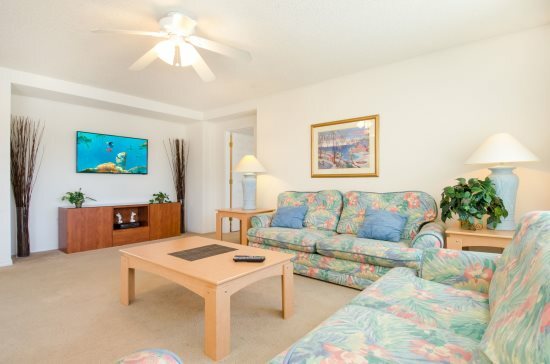 The living area is comfortably furnished and features a flat screen television and DVD player. 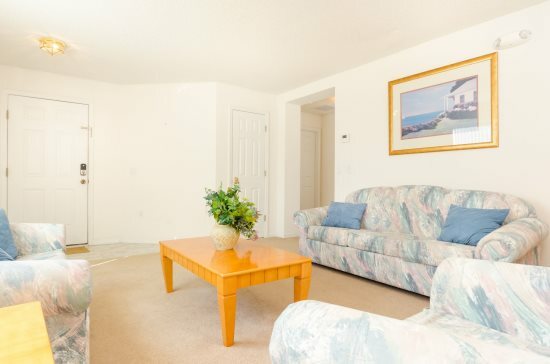 Another feature that our guests like is the extra sitting room that this home has. 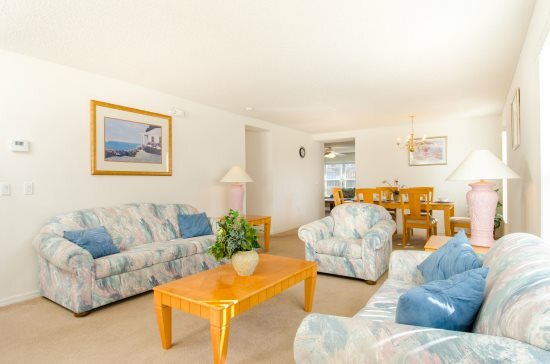 This adds even more room for the larger family to enjoy and has been a major plus with our guests in the past. 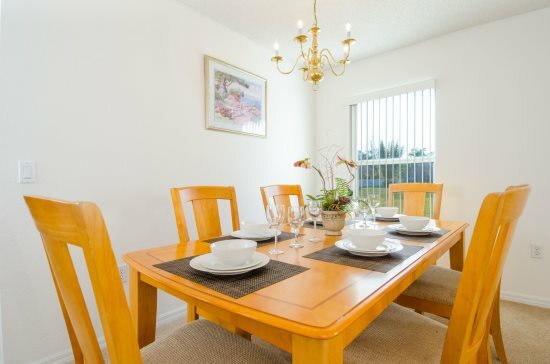 The dining area is adjacent to a fully equipped kitchen which is equipped with dishwasher, stove, microwave and fridge-freezer, waste disposal. All kitchen utensils, crockery, pots and pans etc. 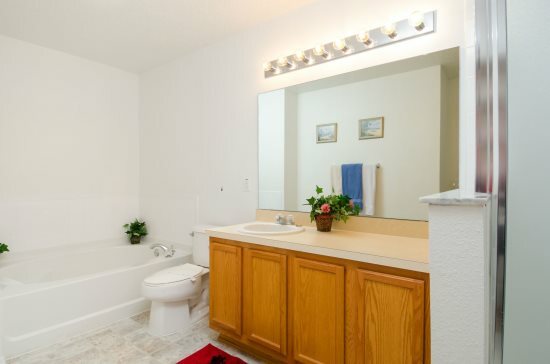 are provided as are all towels and linens. 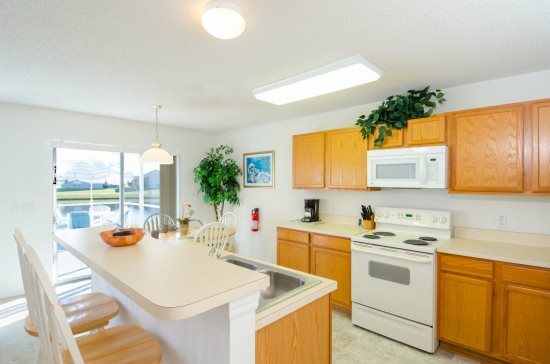 There is also a breakfast nook next to the kitchen to enjoy your morning coffee while you plan your day. 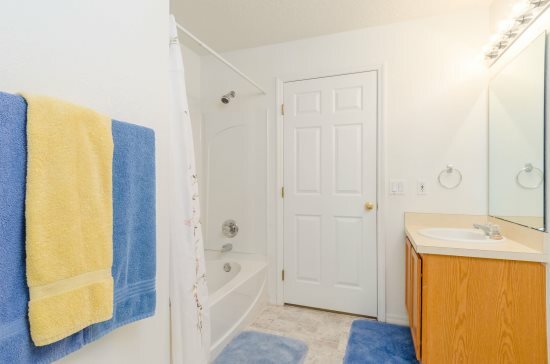 The home also has a full size washer and dryer. 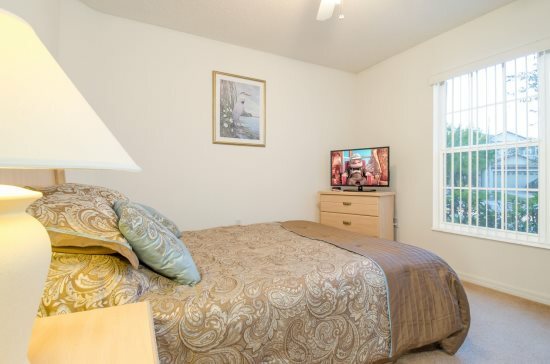 The master bedroom is very spacious and features a king size bed, flat screen TV and full en-suite facilities. 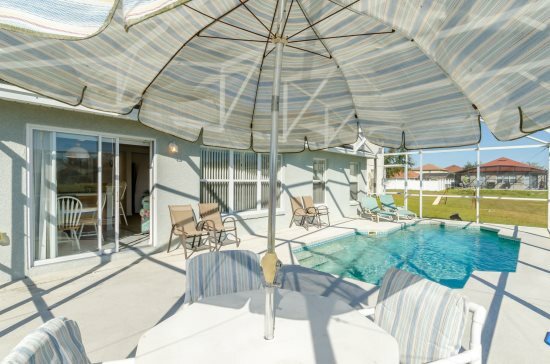 The homes patio doors lead out to your own private fully screened in swimming pool, and spacious pool sun deck which has the added bonus of being South facing for maximum exposure to our wonderful Florida sunshine!. From the pool deck you have a beautiful view of the pond at the rear of the home. Yes there are fish in the pond if anyone wants to have a bit of fun trying to catch some fish! And for some more indoor fun the garage area has a pool table. Don't delay, book today before someone else does! 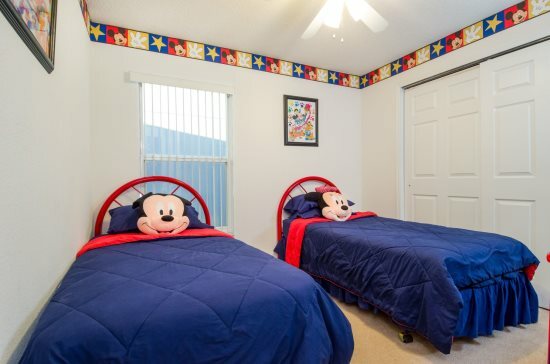 Liberty Village Kissimmee are just 10 minutes from Disney World and close to all the Orlando attractions you want to visit - great dining, shopping, golf and entertainment. 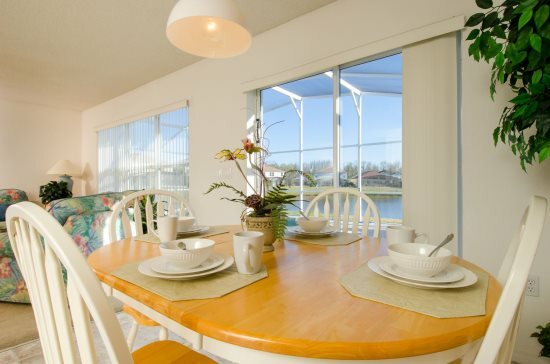 Liberty Village Kissimmee houses typically have private, screened swimming pools, lake views, and Liberty Village villas have full, gourmet kitchens and lots of space for relaxing with family and friends. 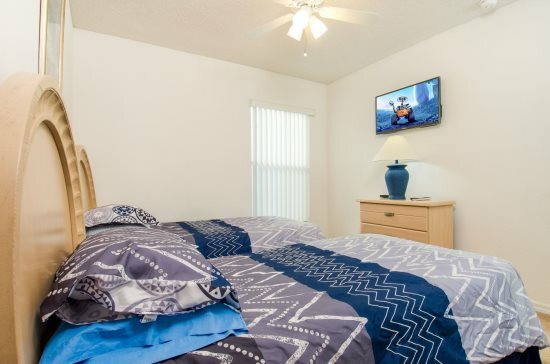 Why try to get comfortable in Kissimmee hotels, when you can have all the comforts of home and more in Liberty Village vacation homes. Liberty Village Kissimmee, FL is a smaller community, the homes in Liberty Village Orlando are all single family homes and many with private pool. 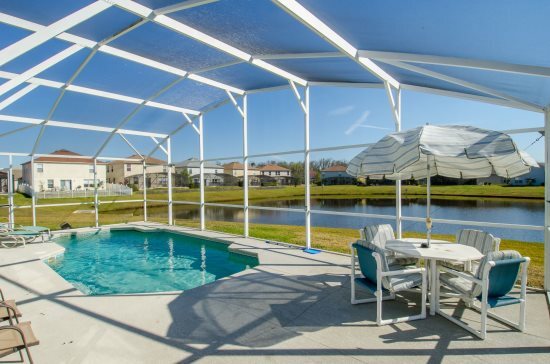 If wanting a private pool in Liberty Village Kissimmee, be sure to a home with one when making a reservation. If renting in winter, be sure to check out the seasonal temperature as heating a pool typically costs extra. 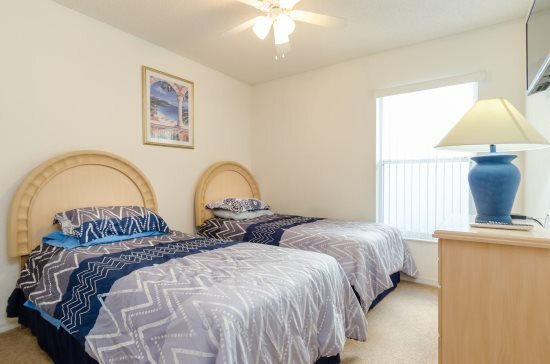 All amenities are nearby with the US192 close by and with restaurants and a supermarket just a short drive away. For the golfers in the family there are several PGA championship courses in the area. 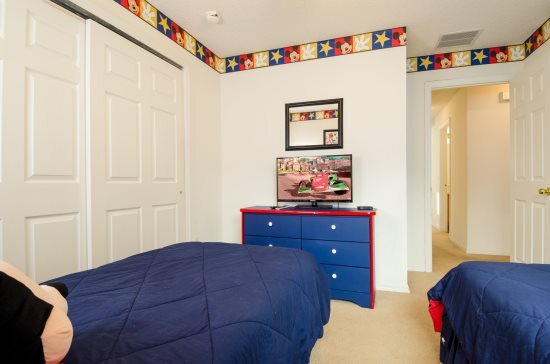 Orlando4Villas opinion, Liberty Village Kissimmee offers much for the family coming on vacation to the Orlando / Kissimmee area. 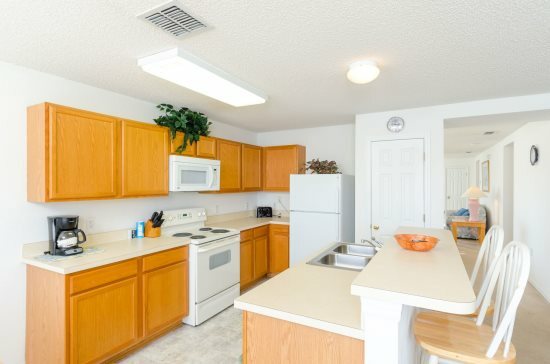 Liberty Village Kissimmee houses typically have private, screened swimming pools, lake views, and Liberty Village villas have full, gourmet kitchens and lots of space for relaxing with family and friends. 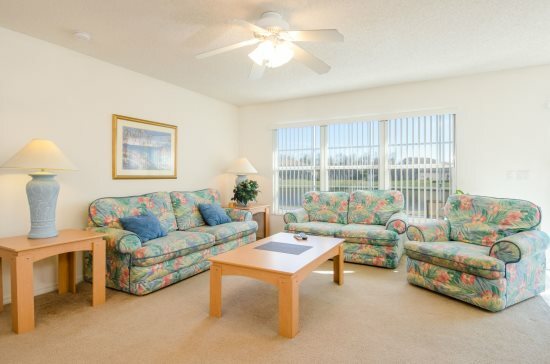 Orlando4Villas has the large selection of vacataion homes available for rent in Liberty Village.